Schneider’s team modelled stratocumulus clouds over subtropical oceans, which cover around 7 per cent of Earth’s surface and cool the planet by reflecting the sun’s heat back into space. 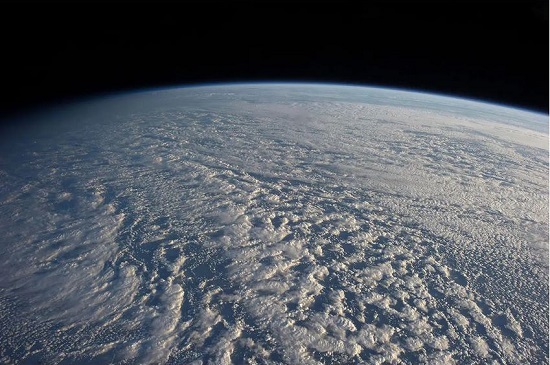 They found there was a sudden transition when CO2 levels reached around 1200 parts per million (ppm) — the stratocumulus clouds broke up and disappeared. The loss of the reflective effect of the clouds would lead to runaway warming which would start as CO2 levels reached 1200. 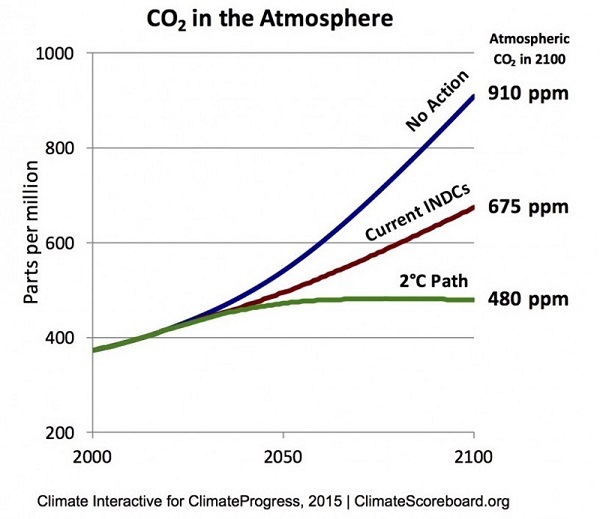 If we do nothing to curb emissions, CO2 levels would could expect to pass 1200 ppm some decades after 2100. Other scientists not involved in the research have said the findings make sense, but no-one is too worried about it as they assume that we will in fact curb emissions. If they looked at the issue of tipping points cutting in from 1.5°C, a point where the whole scenario is taken out of our hands, they might worry a bit more. The researchers believe that dissipating clouds could explain the extreme warming event of the Paleocene–Eocene Thermal Maximum (PETM) 55m years ago, when global temperatures increased by 5-8°C and drove widespread extinction of species on both the oceans and land. CO2 levels then were not high enough to produce the warming that actually happened, so the dissipation of clouds may indeed have played a pert. While there were extinctions generally, there was an increase in mammalian abundance, including primates during the PETM. However, we are putting CO2 into the atmosphere somewhere between 20 and 120 times as fast as happened in the PETM, which makes evolutionary human adaptation extremely unlikely if we reach the tipping point this study indicates. Moreover, in the post CO2 is scrambling our brains, but will it kill us all? we found that it would be extreme folly on health grounds alone to allow CO2 levels to exceed 600 ppm. As a species we have flourished with CO2 levels mostly at 180 to 280 ppm. I would also caution that the continents and oceans are differently disposed on the surface of the earth during the PETM 55 mya. 14°C warming would indeed be cataclysmic in our world. It’s not clear which path we are taking, except it is not the green line. There is a longer article on the paper at Carbon Brief. The article Possible climate transitions from breakup of stratocumulus decks under greenhouse warming can be purchased at Nature Geoscience. Doesn’t look good for my recently born grandson. Depending on which of your graphs we use he will still be looking at twice the CO2 level when I was born by the time he is more age. Just clarifying – are you being serious or sarcastic? The NSW government prepared sweeping climate change policies to decarbonise the state’s economy only to have the plans shelved when Gladys Berejiklian became Premier, documents obtained by the Herald show. The program included a proposal to “embed climate change consideration into government decision making”, and was developed with the advice of the government-appointed expert panel, the Climate Change Council. Gladys’ apparent (lack of) action on climate change appears not good for the future of your recently born grandson. Confusion over names. Comment now reads go Greta. BTW. One of my friends keeps talking about the earth being close to a Maunder minimum. Google didn’t produce anything clear. what do you know? I’m glad that’s been clarified. One of my friends keeps talking about the earth being close to a Maunder minimum. Google didn’t produce anything clear. what do you know? May I suggest to you that you clarify with your friend where that notion comes from. Ask for a reference so that you may check out the veracity of the information. Who knows – it may come from JoNova or WattsUpWithThat? At SkepticalScience.com there’s this page headlined A grand solar minimum would barely make a dent in human-caused global warming. And this page headlined Are we heading into a new Ice Age? Perhaps you could refer your friend to the SkepticalScience info? Or would that be a futile exercise – for your friend does ideology trump facts/evidence? John, a Maunder Minimum is about sun spots, or a lack of them. Imagine the sun as a beach ball, 4 feet in diameter (1.22m). The earth is a grape about 150m away. Are changes in sunspots seriously going to make a difference to the weather? Inigo Jones thought they did and I’m sure many farmers thought so too. They used to run his forecasts on the ABC in the bush. I recall his successor, Lennox Walker, advertising sprinklers on TV along with his forecast of a dry summer. It turned out to be one of the wettest ever. Brian: Maunder min was associated with the little ice age when the Thames froze a few centuries ago. We appear to be going into a sunspot minimum at the moment that implies that the temperatures we a getting at the moment are lower than the average we would expect with the current GHG levels. The Maunder Minimum roughly coincided with the middle part of the Little Ice Age, during which Europe and North America experienced colder than average temperatures. Whether there is a causal relationship, however, is still under evaluation. Research at the Technical University of Denmark and the Hebrew University of Jerusalem has linked large solar eruptions to changes in the Earth’s cloud cover and clouds are known to affect global temperatures. The current best hypothesis for the cause of the Little Ice Age is that it was the result of volcanic action. The onset of the Little Ice Age also occurred well before the beginning of the Maunder minimum, and northern-hemisphere temperatures during the Maunder minimum were not significantly different from the previous 80 years, suggesting a decline in solar activity was not the main causal driver of the Little Ice Age. The correlation between low sunspot activity and cold winters in England has recently been analyzed using the longest existing surface temperature record, the Central England Temperature record. They emphasize that this is a regional and seasonal effect relating to European winters, and not a global effect. A potential explanation of this has been offered by observations by NASA’s Solar Radiation and Climate Experiment, which suggest that solar UV output is more variable over the course of the solar cycle than scientists had previously thought. 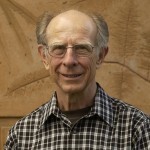 In 2011, an article was published in the Nature Geoscience journal that uses a climate model with stratospheric layers and the SORCE data to tie low solar activity to jet stream behavior and mild winters in some places (southern Europe and Canada/Greenland) and colder winters in others (northern Europe and the United States). In Europe, examples of very cold winters are 1683–84, 1694–95, and the winter of 1708–09. The term “Little Ice Age” applied to the Maunder minimum is something of a misnomer, as it implies a period of unremitting cold (and on a global scale), which was not the case. For example, the coldest winter in the Central England Temperature record is 1683–1684, but summers during the Maunder minimum were not significantly different from those seen in subsequent years. The drop in global average temperatures in paleoclimate reconstructions at the start of the Little Ice Age was between about 1560 and 1600, whereas the Maunder minimum began almost 50 years later………. Worth reading the whole article and googling more on the subject of solar minimum and the effect of climate. The stuff that came up in my research felt a bit iffy. 1. These two factors, orbit and tilt, are weak and are not acting within the same timescale – they are out of phase by about 10,000 years. This means that their combined effect would probably be too weak to trigger an ice age. You have to go back 430,000 years to find an interglacial with similar conditions, and this interglacial lasted about 30,000 years. 2. The warming effect from CO2 and other greenhouse gases is greater than the cooling effect expected from natural factors. Without human interference, the Earth’s orbit and tilt, a slight decline in solar output since the 1950s and volcanic activity would have led to global cooling. Yet global temperatures are definitely on the rise. It can therefore be concluded that with CO2 concentrations set to continue to rise, a return to ice age conditions seems very unlikely. Instead, temperatures are increasing and this increase may come at a considerable cost with few or no benefits. CO2 concentrations are dominating natural effects. Compare the CO2 levels during the Maunder Minimum (between 1645 and 1715), the Dalton Minimum (a period of low but not as low as the Maunder Minimum solar activity between 1790 and 1830) and current day. 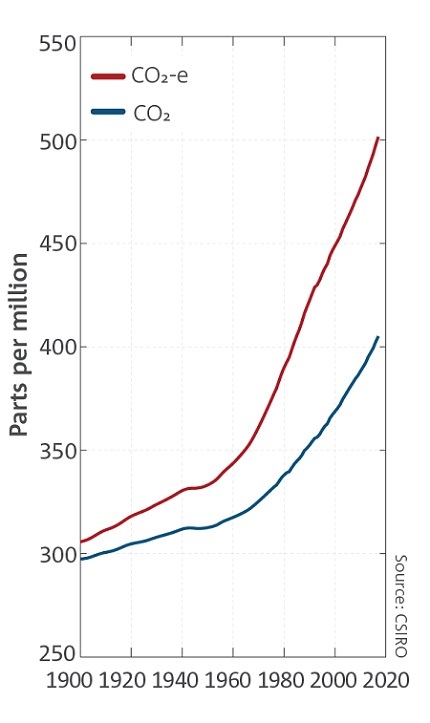 After hundreds of thousands of years of CO2 levels never exceeding 300 parts per million in air, the concentration of the greenhouse gas is now over 400 parts per million, continuing a rise that began with the Industrial Revolution. Nothing gets done about CO2 emissions because well-funded fossil fuel companies lobby governments and spread disinformation to delay action. See The Guardian article headlined Top oil firms spending millions lobbying to block climate change policies, says report, posted yesterday. Thanks for the link, Graham. It was on the TV news tonight. I’ve always said that parts of East Antarctica would go, along with melting on West Antarctica and Greenland. Not the whole 7 metres worth of Totten, but enough to cause grief towards the end of the century. After a prod from Treasurer Josh Frydenberg, the financial regulator this month reminded superannuation funds that their job was to stay out of political causes, and stick to their knitting: looking after members’ interests. Then, the day after this warning was revealed, the very same regulator, the Australian Prudential Regulation Authority (APRA), upped the pressure on our biggest financial institutions to take more action to deal with climate change risks. Do those two directions from APRA sound like they might be in conflict? They shouldn’t. Now, APRA says it wants to see a move from “awareness to action.” It wants banks, insurers and wealth managers to look at climate risks just like any other part of their risk management framework — not as a social responsibility issue. Risk management should rank high on super funds duties to their customers. This includes reputational risks associated with things like investing in fossil fuels and the risk climate change is posing to various industries that super funds invest in. Problem with F is that his party has made things that should be a matter of common sense into political issues because what his party wants to do is contrary to common sense. “Contrary to common sense” from an existential threat to humanity perspective – yes. But the COALition appear to be looking after the short-term interests of their fossil fuel donors. Apparently, who pays the piper, calls the tune. New York: An elaborate sting operation has revealed that senior One Nation figures, including Pauline Hanson’s chief-of-staff, sought millions of dollars in donations from the US pro-gun lobby to help them water down Australia’s gun control laws. A journalist from news network Al Jazeera, posing as the head of a fake Australian gun lobby group, secretly filmed Hanson’s top adviser James Ashby and One Nation’s Queensland leader Steve Dickson during a visit to Washington DC last year. Greater demand for energy and more extreme temperatures saw global carbon emissions reach a record high in 2018 partly because of higher coal use, according to the International Energy Agency (IEA). That is despite energy generation from wind and solar farms growing at a double-digit pace. Most of the electricity generated by coal came from new power plants in Asia. Coal use rose 0.7 per cent last year, with higher demand for coal coming from Asian countries, including China and India. Carbon emissions rose by 1.7 per cent in 2018 to a record 33.1 billion tonnes, with coal making up one third of the total increase, according to the IEA’s Global Energy and C02 Status Report. I used to relax watching cooking shows on TV. Now I can’t relax with anything to do with cooking because cooking has moved from niche entertainment into mainstream news – and we have changed from being viewers to being one of the ingredients. Seriously though, if things are left unchecked, that 910ppm and even 1200ppm might be passed long before the Year 2100. There is no comfort in knowing that life on Earth survived a 5 to 8 degree temperature rise in the PETM because, as stated, we are pumping carbon dioxide, among other material, into our atmosphere at 20 to 120 time the rate in PETM – so we are talking about two very different situations here. The Anthropocene and its effects are definitely not the PETM. That said, there is still a lot we can learn by a swift and furious study of the PETM. Wonder how long it will be before the word, genocide, enters discussions on human responsibility for the deteriorating situation? John, thanks for the link. I think the total referred to (33.1 billion tonnes) represents fossil fuel direct emissions as taken from adding up countries’ national accounts. The real figure of CO2 equivalent would be over 50 billion. The Stern Review in 2006 was talking about around 42 billion, from memory. This is why the real figure to take notice of to tell how we are going is the atmospheric PPM concentrations. However, there are useful stories in these accounts.